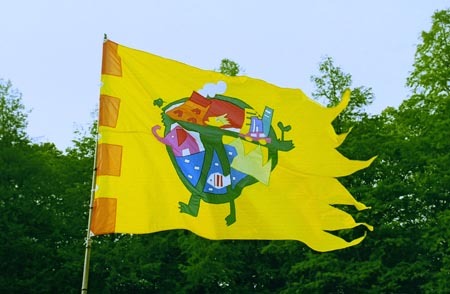 Mainichi TV station's Campaign "Environment of the Earth"
Flags were used in the "Environment of the Earth" campaign that aired during a commercial broadcasting festival. This is the theme flag. How do people feel when the flag flaps? When you close your eyes and breathe deeply, you can catch the sound of the flag flapping. Listen to the wind, birdsong, murmuring of a stream, noises of living, and feel the warmth of the sun . You feel your body's shape as wind flows across your face. We really feel we are alive the same as plants, birds, or animals, when the wind circulates to every life. We must find wisdom to live together. We must know the foolishness of fighting, because everything is alive on the earth has its own place on the same tiny life-line.